For the municipality, see Skagafjörður (municipality). Skagafjörður is about 40 km long and 15 km wide, situated between Tröllaskagi to the east and the Skagi Peninsula to the west. There are two municipalities in the area, Skagafjörður Municipality (approx. 4140 inhabitants) and Akrahreppur Municipality (approx. 210 inhabitants). This is one of Iceland's most prosperous agricultural regions, with widespread dairy and sheep farming in addition to the horse breeding for which the district is famed. Skagafjörður is the only county in Iceland where horses outnumber people. 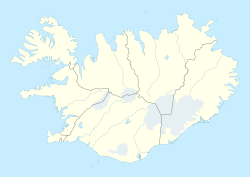 It is a centre for agriculture, and some fisheries are also based in the settlements of Sauðárkrókur and Hofsós. The people living in Skagafjörður have a reputation for choir singing, horsemanship, and gatherings. There are three islands in the bay: Málmey, Drangey and Lundey (Puffin Island). The bay is located in a submerged glacial valley which is continued southwards by a plain in which lies the delta of the Héraðsvötn river. The main settlement of this valley is Varmahlíð. "Skagafjörður.is - Um Skagafjörð - Landfræðilegar upplýsingar". Archived from the original on 4 November 2005. Retrieved 23 November 2005. ^ "Skagafjörður (The Municipality of Skagafjörður)". Invest in Skagafjörður. Retrieved 25 March 2015. ^ "Skagafjordur". Icelandic Travel TV. Retrieved 25 March 2015. ^ "The Horse Roundup". FOOTSTEPS OF GIANTS BLOG. Retrieved 25 March 2015. ^ Arnarsdóttir., Eygló Svala. "Road Trip". Iceland Review Online. This page was last edited on 12 November 2018, at 10:24 (UTC).